The Basis Bedframe debe.destyle by de Breuyn makes it very easy for you and is a bed solution for infants up to young adults. You can configure five different beds with different heights from the basic kit. So, the right bed solution for every age group is always to hand. There is no limit to the imagination for the basis bed. Create a four-poster bed for your princess at the lowest level, the little adventurer gets a play bed at three different heights and the shy teenager a bunk bed at a lofty height, where he or she can be undisturbed. 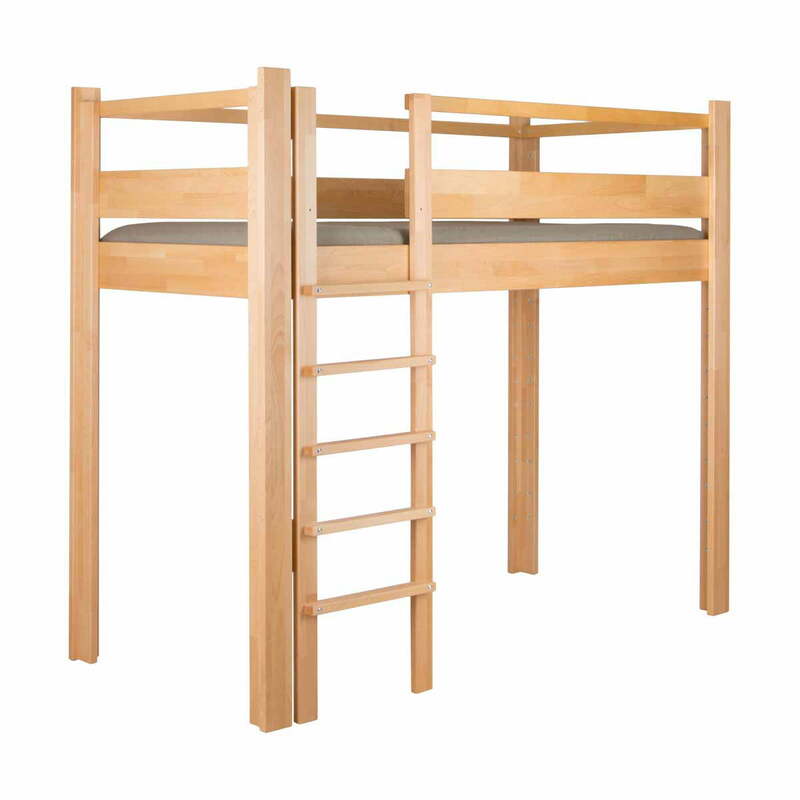 Five different heights are available and the bed grows with your child. 1st level four-poster bed: a cosy four-poster bed with safety boards for children over two years old or a cool four-poster bed for teenagers. 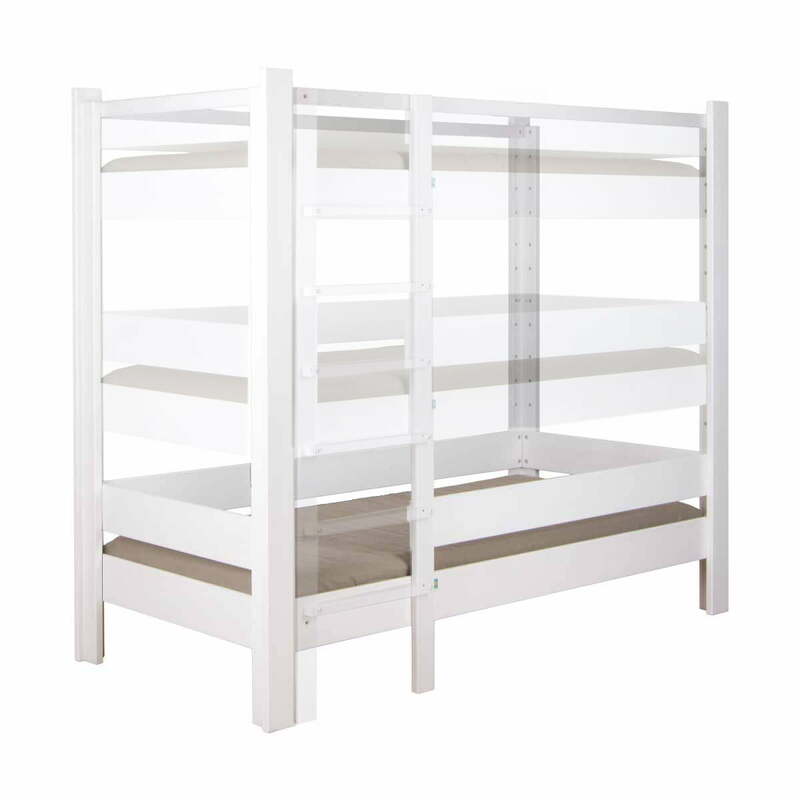 2nd level low play bed : for small bunk bed starters from about two and a half years old with a canopy and an extra high bar. 3rd level medium play bed: for children over three years old and one level higher than the low bed version. 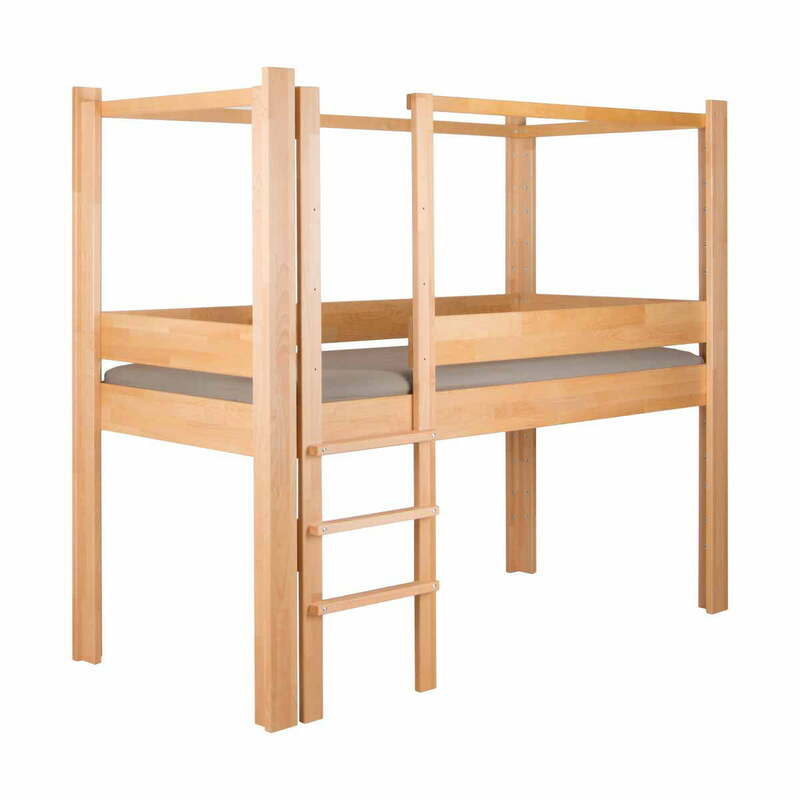 4th level high play bed: play bed for experienced bunk bed sleepers, who have already passed the test in one of the lower levels. 5th level young adult bed: a lot of space is created under the bed sleeping area, which can be used as a work area or sofa. The best feature: you and your child don't need to make a commitment. Each variation can be implemented, customised and extended any time at your will. From the playful bunk bed to the cool bed for teenagers? No problem! 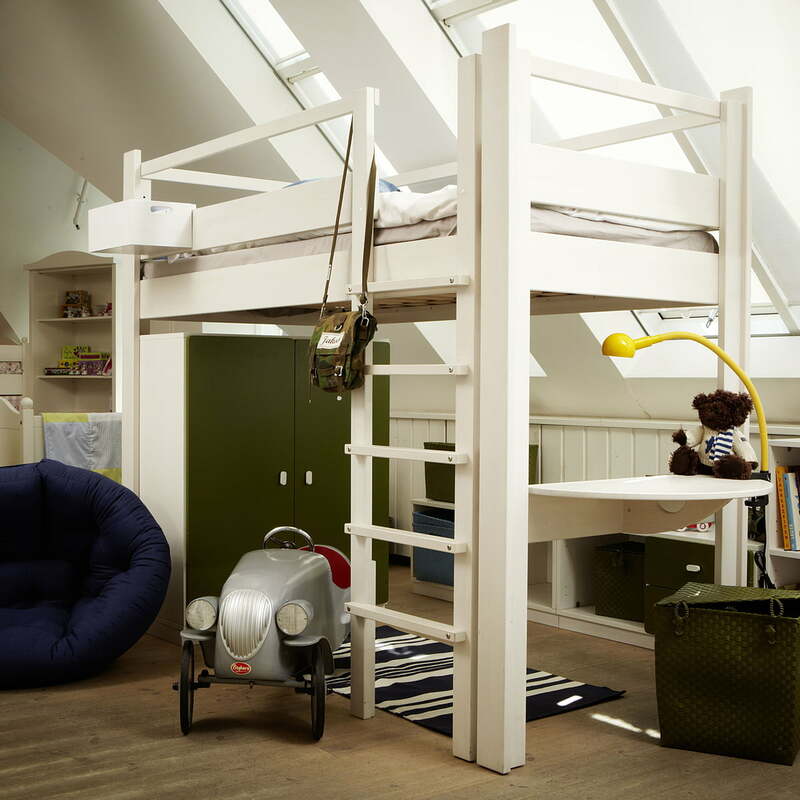 Does your child miss the bunk bed and realises that the simple four-poster bed is too boring? Simply take it back to the earlier version! But this time a small bedside table needs to be added and the bars ought to be removed? Not a problem either as each part of the bed can be removed as desired or mounted and extended with other elements from the debe.destyle collection. The Basis Bedframe debe.destyle by de Breuyn is produced in oiled beech wood or colour stained with a visible wood structure in different colours. If you have any questions about variations or the comprehensive range of accessories, such as drawers or guest bed extensions, feel free to contact us. 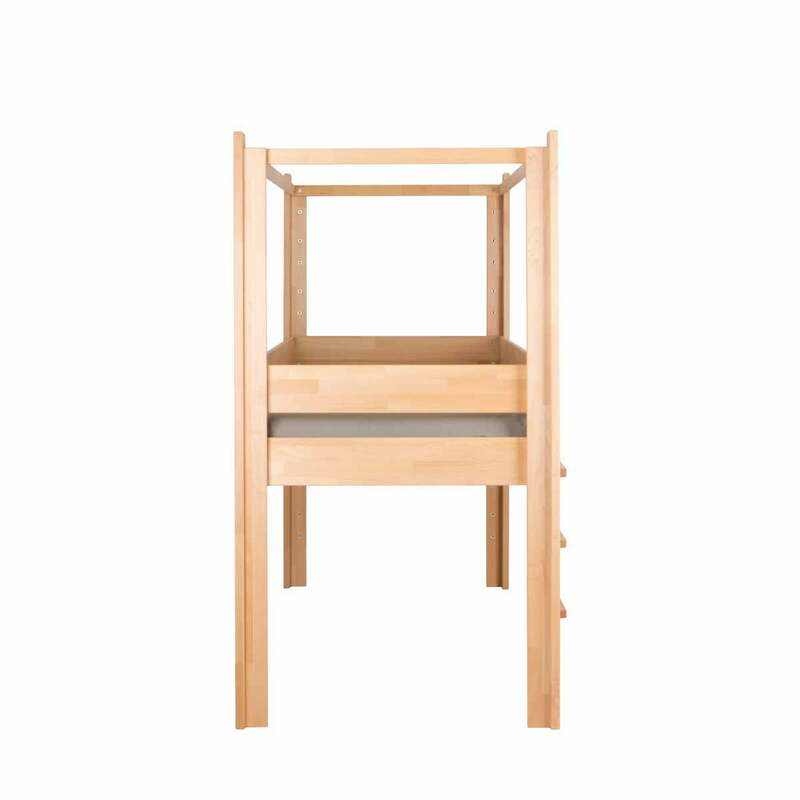 Level 1 Basis Bedframe debe.destyle by de Breuyn, natural. A cosy four-poster bed with safety boards for children over two years old or a cool four-poster bed for teenagers. De Breuyn has been manufacturing children's furniture for over 30 years. To celebrate this occasion, the manufacturer launched the special edition base bed in white lacquered spruce. Level 2 Basis Bedframe debe.destyle by de Breuyn, natural. 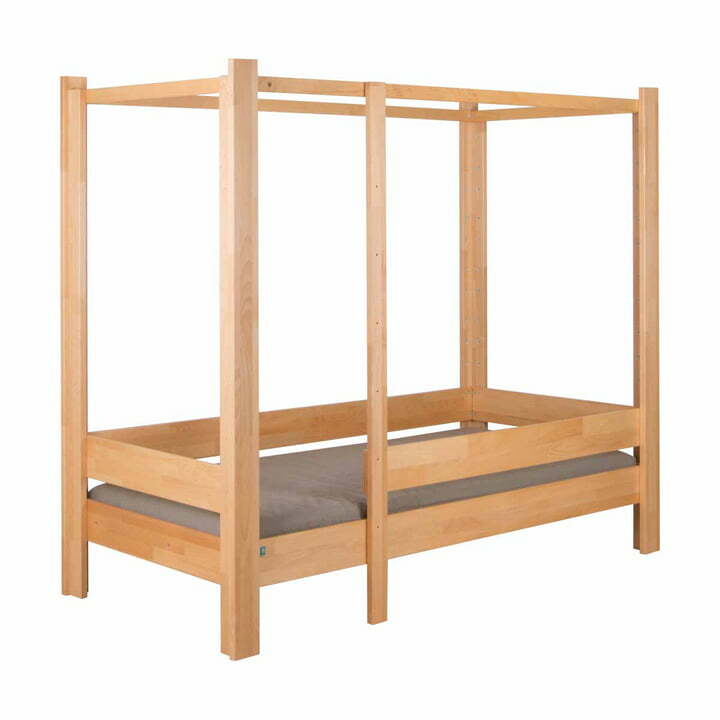 Low play bed for small bunk bed starters from about two and a half years with a canopy and an extra high bar. Level 3 Basis Bedframe debe.destyle by de Breuyn, natural. Medium play bed for children over three years old and one level higher than the low bed version. Level 4 Basis Bedframe debe.destyle by de Breuyn, natural. 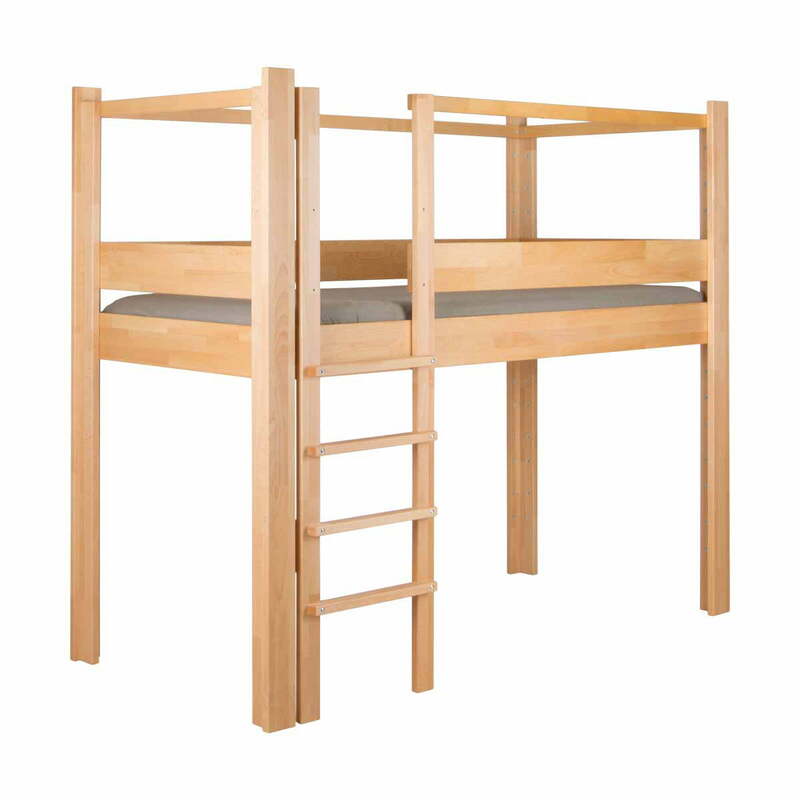 Play bed height for experienced bunk bed sleepers, who have already passed the test in one of the lower levels. Level 5 Basis Bedframe debe.destyle by de Breuyn, natural. A lot of space is created under the bed sleeping area which can be used as a work area or sofa. Group picture of the basic bed debe.destyle from de Breuyn, natural. 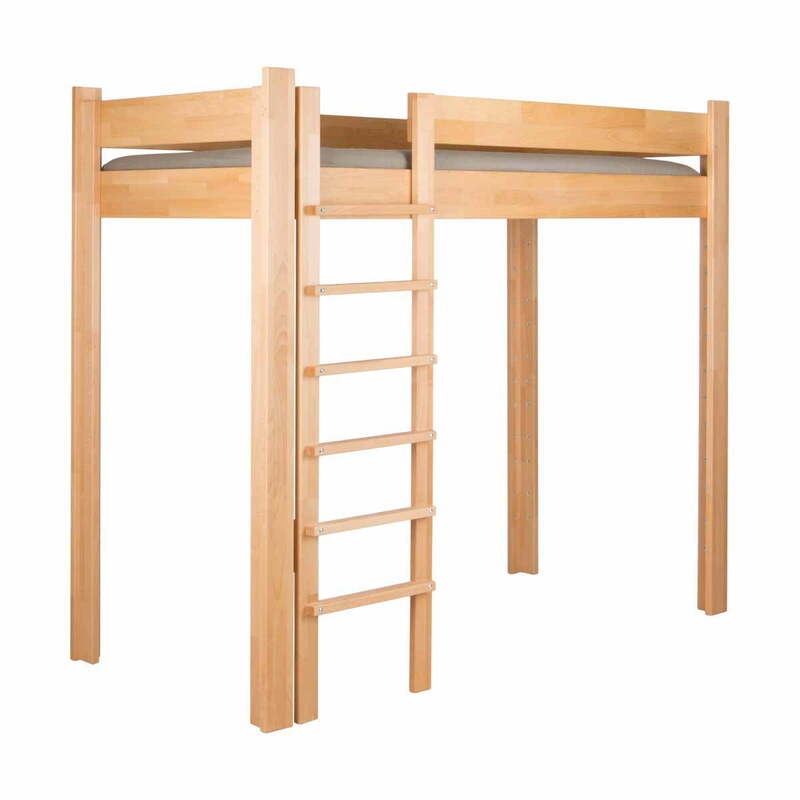 Five different heights and bed solutions are available and the bed grows with your child. The debe.destyle Base Bed by De Breuyn avoids having to buy several beds as your child grows from an infant to a teenager. 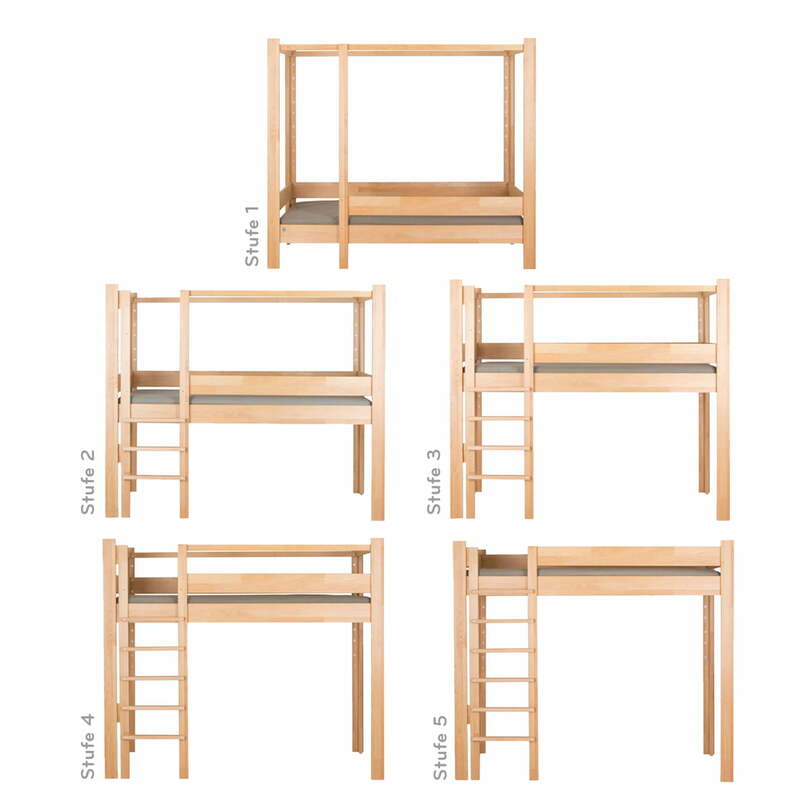 From a base kit, you can configure five different beds with different heights. So, having the right bed for each age group is already at hand. Base bed debe.destyle by De Breuyn: The debe.destyle base bed ensures children have sweet dreams directly above the ground as well as just below the ceiling!